It happens eventually. 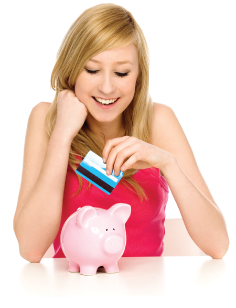 Kids become adults and outgrow their Teen Club savings accounts. If you have a son or daughter who is about to turn 18, perhaps it’s time to make the transition to a Max Checking account. They’ll gain adult-level access to their funds 24/7, enjoy a free ATM/debit card, Online Banking and our newly designed mobile app and be eligible to earn 3% APY interest by meeting the monthly usage requirements*. Also, you can connect to your child’s account to make balance transfers if they’re away at school. And of course, debit cards are safer than cash for traveling students. Switching over to a Max Checking account is easy. Simply stop by any branch with your teen and they’ll be on their way to getting that new grown-up debit card! *To earn 3% APY, simply meet the following requirements: 1. Direct deposit into your Max Checking account (may be waived if necessary) 2. Minimum of 10 debit card purchases per month. 3. Minimum of 4 logins to online banking per month. 4. Be eligible for and sign up to receive eStatements/eNotices.